Details: Embroidered Club badge and Manufacturers logo. Sponsor felt. Description: Excellent Condition, two tiny pulls. 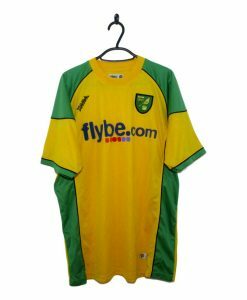 The 2003-04 Norwich City Home Shirt made by Xara has a yellow base colour with green details on the top of the sleeves with two yellow stripes. The sides of the football shirt are green. Xara have their name on the right breast whilst the Norwich City badge is on the left breast with black lettering around it which reads ‘Division 1 Champions 2003/04. Car manufacturer Proton have their logo in the middle of the jersey.